Yes, it's been a while since this blog has dealt with one of the Complete Case Files books--1990-1991 was an unusually active era for new Dredd-related stories. 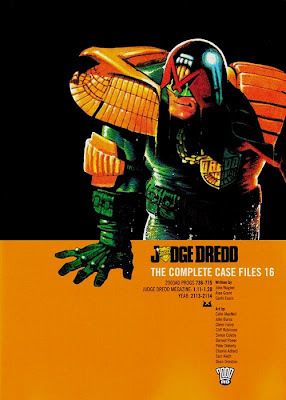 This volume, though, covers the mother of all transitional periods: John Wagner's initial farewell to Dredd, at least in the weekly series. 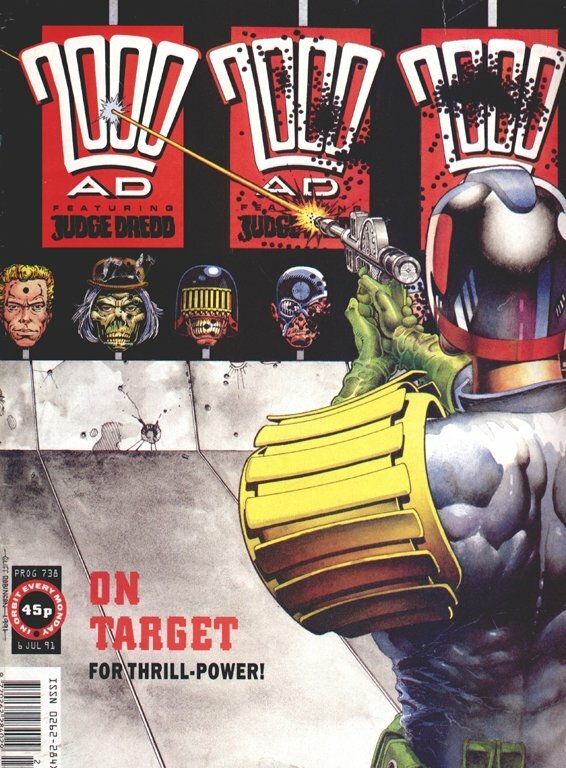 By the point where this volume starts, Garth Ennis had effectively passed his audition to take over Dredd, and 2000 AD had mostly burned off its stockpile of Wagner-written one-offs--the only one that appears here is "Watchdogs," a six-pager that could have appeared at nearly any time in the strip's history. 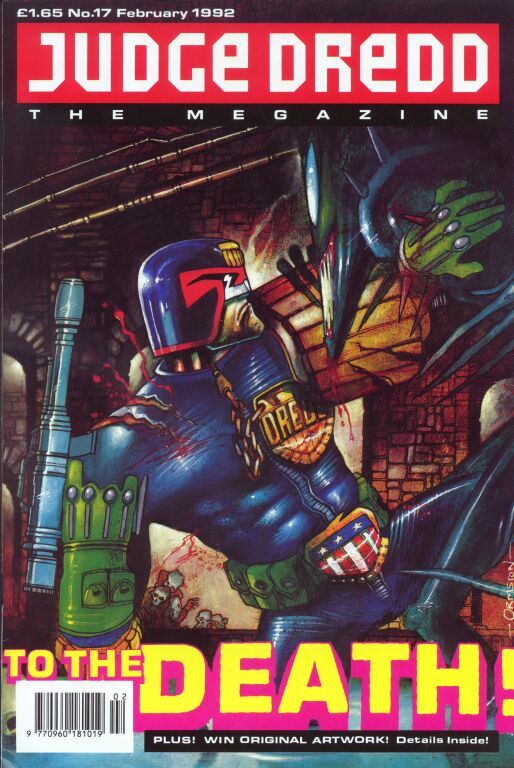 Unusually for this period, it's drawn by Cliff Robinson, whose specialty at the time was doing generic Dredd illustrations, like the one below, that could appear on the cover of 2000 AD in lieu of an image that had to do with one of the specific stories inside. 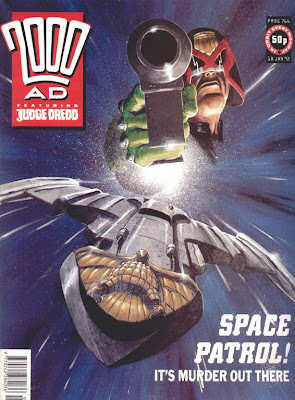 Week-to-week continuity wasn't one of the series' strengths at this point--there were a whole lot of artists drawing Dredd, and a lot of the early episodes here have the sense that they're marking time. Both of the first two stories in this volume have "mutants come over the west wall of the city and Dredd kills them" plots, as did "The Gipper's Big Night" in Megazine #1.10, which came out the same month. Simon Coleby is the most prominent artist on the weekly strip at this point, and he really hadn't hit his stride yet (I like his later Low Life material much better): at a time when a lot of Dredd's other artists were doing fancy painted work, his more American-style, light-comedy approach is something of a comedown. 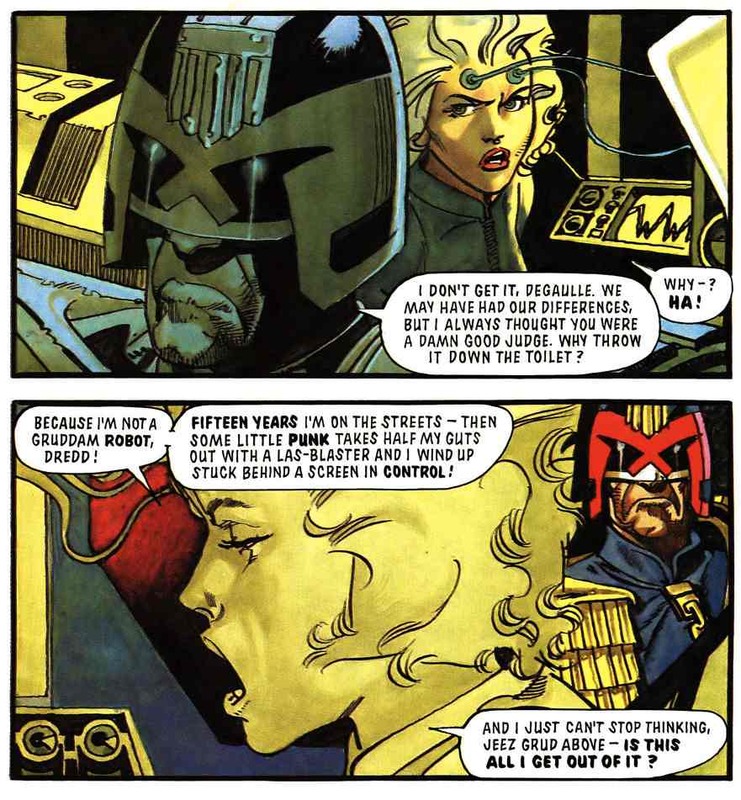 And, given what was coming, it'd have been nice to see a bit more buildup to the "democracy referendum happens at Dredd's request" plot. After three months' worth of throwaways, parodies (the Twin Peaks riff is particularly weak) and Ennis showing off his record collection, we finally get to this volume's centerpiece, "The Devil You Know"/"Twilight's Last Gleaming," a continuous story with its first half written by Wagner and its second by Ennis. I'd love to know how it came together, actually: I can't think of any other examples of a writer closely associated with an ongoing comics serial deliberately setting up loose ends for his or her successor to resolve. If "Necropolis" was Wagner wrapping up the greater arc of his run, "The Devil You Know" is effectively him giving Ennis his blessing--leaving on a cliffhanger, and letting Ennis decide which way the premise of the entire series would go. Where Ennis took it, curiously, was straight back to Wagnerland. 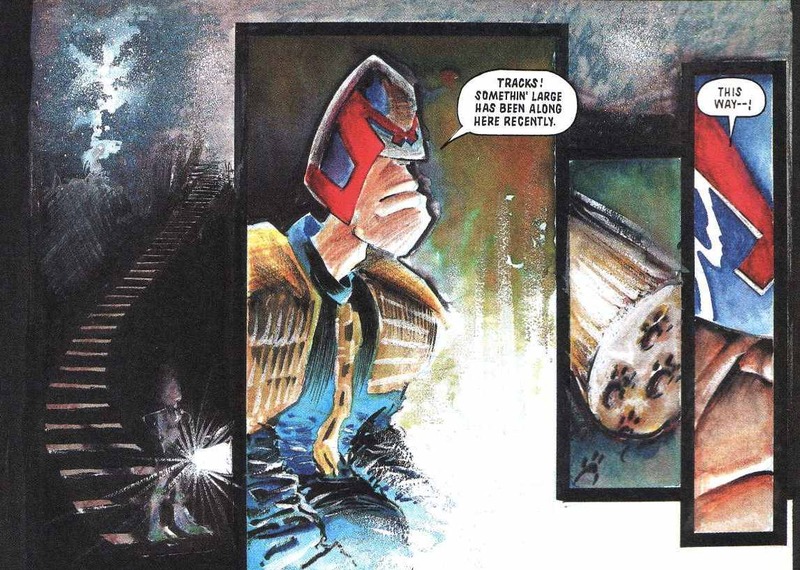 "Twilight's Last Gleaming" is Ennis demonstrating that he knows and loves the Dredd canon, and that he takes it very seriously--as far as impressing Dreddheads like me goes, he couldn't have picked a better character to bring back (on the story's second page!) than Degaulle--one of the greatest bit players in the strip's history--or a better way to handle her appearance than establishing what had happened off-panel since we last saw her to make her even angrier and more bitter. But then he actually starts repeating some of Wagner and Grant's beats: the "God help me, I love it" speech from "Return to Mega-City" (shouldn't that be "Grud"? ), the slobby family watching the election results from "Letter from a Democrat" and "Revolution." Ennis's "Dredd is so awesome!!" streak comes through here, too--less in the scene where Blondel Dupre finally buckles to Dredd than in the icky-rather-than-heartbreaking one that follows it, in which she explains that "it takes someone special to rule this city, not us..." Wagner's version of Dredd is a useful monster; Ennis's is tough enough to do hard things. In general, Ennis has always valued toughness more than pretty much any other comics writer I know of. Right after "Twilight's Last Gleaming," Ennis's run starts flailing a bit. (His strength, then and now, is the extended, character-based drama, not the six-page action-comedy, and his idea of a gag is very often a gross-out.) By that point, he'd also taken over another old Grant/Wagner series, Strontium Dog, and assumed control of Hellblazer from Jamie Delano; unlike Dredd or Strontium Dog, he promptly made Hellblazer his own. ("Dangerous Habits," his first John Constantine story, beats any 2000 AD serial he wrote.) 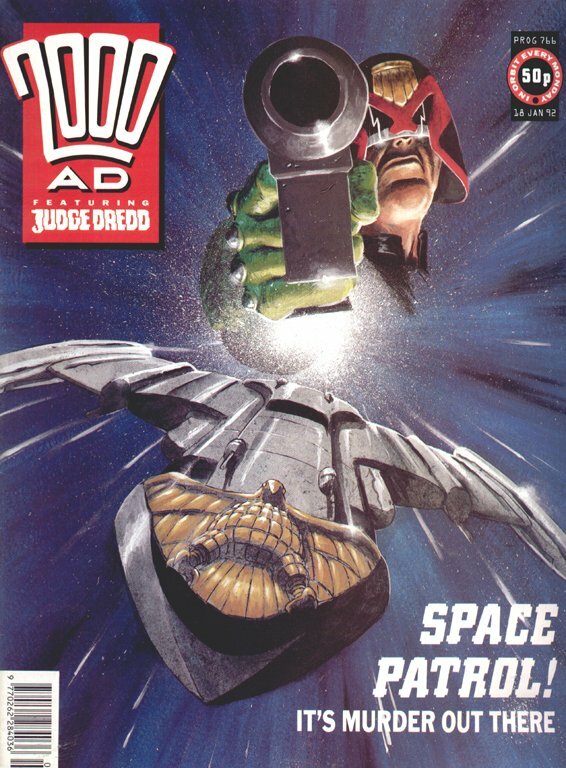 The six-part Dredd-on-a-spaceship piece "Justice One" is more his speed than the wacky one-offs--he's got actual characters to work with and a plot to develop--but Peter Doherty, fresh off his Judge Death serial, doesn't quite have the chops for grim suspense, and ends up coming off as a slightly diluted variation on John Burns' theme. Since the Megazine material reprinted in this volume didn't have credits on the story pages themselves (and the book isn't much help), I've turned to BARNEY to see who was responsible, and it turns out this era was the Alan Grant show. 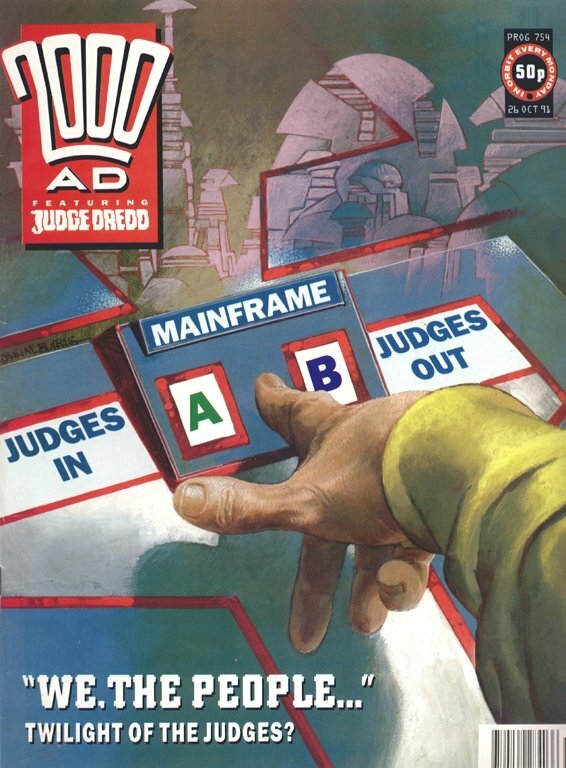 He wrote all ten episodes from the Meg here, as well as the curious side-trip "The Art of Geomancy" in 2000 AD (his first Dredd story there in two years, and last for another four years)--the sentence "The land was a living thing" on that story's first page is an unmistakable tipoff that Grant's at the wheel. So's the presence of the spunky psychic Judge who shows up to push the plot of "Raptaur" forward at appropriate moments. 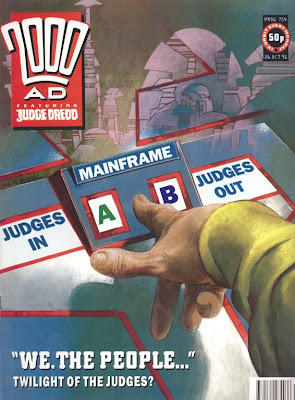 When I encountered this story in here, I briefly wondered why Judge Karyn was occupying the role usually reserved for Anderson, and then realized that it's because "Raptaur" began in mid-1991, between the first and second halves of "Engram," i.e. while Anderson was institutionalized. (The second half of "Engram" ran just in time for her to get out and appear in "Judgment on Gotham" a few weeks later.) Karyn seems to have only appeared in one subsequent Grant-written story ("Raptaur Returns," naturally), but she had her own, never-reprinted series in the Meg in 1994, and Gordon Rennie wrote a few stories involving her in the mid-2000s. 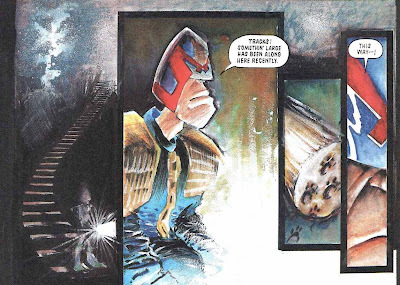 It's also worth noting that the artwork on Dredd stories in this era of the Megazine sometimes went way further out than in the weekly (the peak of that impulse, perhaps, being Mike McMahon's triple-fortissimo "Howler" a few years later). "Raptaur" is a very straightforward Dredd-vs.-monster story in a lot of ways (and an exceptionally lengthy one for how minor it is--time-wise, it ran as long as "Oz"), but Dean Ormston's artwork for it has a wild, thrashing line that goes nicely with the Alien-via-Carnage creature he designed for it. (Come to think of it, Carnage didn't appear in Spider-Man until a year later.) Ormston obscures a couple of story beats, and steps on a few gags--right, that's Lois Lane and Clark Kent kissing on top of a building, but having him wear a giant shirt that says CLARK KENT is overdoing it. But the thing that drives this story is a creature that can take you to pieces before you even register its presence, so keeping the viewer's perspective blurred or misdirected isn't a bad idea. Sam Kieth's lunatic, blobby colored-marker (?) work on "I Was a Teenage Mutant Ninja Priest Killer!" --the third Turtles parody in Dredd, following "Eldster Vigilante Mud-Wrestling Ninjas" and "The Juve Mutated Kung Fu Kleggs"--is even further outside the look of Dredd established by 2000 AD, to the point of looking like a parody of the way the character's usually drawn. It's also a very odd story, with its direct reference to Turtles co-creator Kevin Eastman and its non-sequitur "do you get it? huh? do you?" ending. 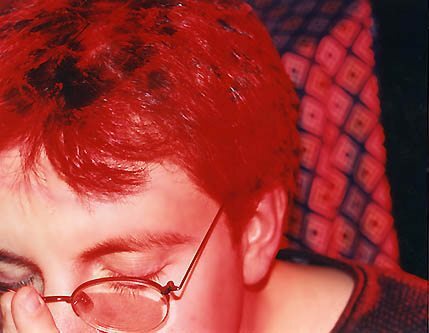 Grant would have been written it right around the time the British branch of Eastman's publishing company, Tundra UK, opened in London in 1991; was there some kind of weird situation involving Eastman, Grant, Kieth, and/or priests that anyone can explain? Next week, we move on to some of the highest-profile Dredd stories of the '90s: The Batman/Judge Dredd Files, with special guest Brenna Zedan!